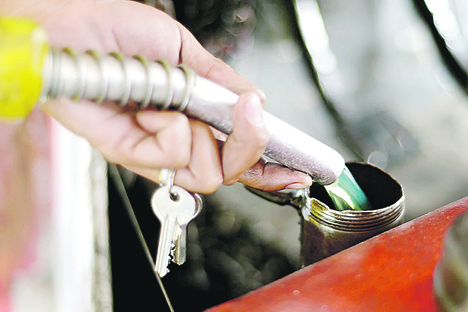 Pump prices went up by as much as P1.05 per liter effective Tuesday amid expectations of tight global oil supply. Oil companies raised the price of gasoline by P1.05 per liter, diesel by P0.75 per liter and kerosene by P0.60 per liter. This is the second consecutive weekly oil price increase after the oil firms increased pump prices by P0.25 per liter for gasoline, P0.20 per liter for diesel and P0.10 per liter for kerosene last April 9. “Phoenix Petroleum Philippines will increase the prices of gasoline by P1.05 per liter and diesel by P0.75 per liter effective 6 a.m. of 16 April,” the oil company said. Seaoil Philippines, Chevron Philippines, PTT Philippines, and Petro Gazz also announced the price increase oil companies are expected to follow suit. Unioil Philippines forecast over the weekend that diesel should go up by P0.60 to P0.70 per liter and gasoline should go up by P0.0.90 to P1 per liter. Price adjustments since the start of the year to a net increase of P6.80 per liter for gasoline, P4.65 per liter for diesel and P3.45 per liter for kerosene. Oil prices went up due to involuntary supply cuts from Venezuela and Iran plus conflict in Libya which supported perceptions of a tightening crude market, the Department of Energy said. DOE said upbeat Chinese economic data eased concerns about waning crude demand. “The price has been driven upwards by OPEC [Organization of Petroleum Exporting Countries]’s ongoing supply cuts, US sanctions against Iran and Venezuela, and strong US jobs data,” the agency said.